Gift deeds convey title to real property from one party to another with no exchange of consideration, monetary or otherwise. Often used to transfer property between family members or to gift property as a charitable act or donation, these conveyances occur during the grantor's lifetime. Gift deeds must contain language that explicitly states that no consideration is expected or required. Ambiguous language, or references to any type of consideration, can make the gift deed contestable in court. A lawful gift deed includes the grantor's full name and marital status, as well as the grantee's full name, marital status, vesting, and mailing address. Vesting describes how the grantee holds title to the property. Generally, real property is owned in either sole ownership or in co-ownership. For Connecticut residential property, the primary methods for holding title in co-ownership are tenancy in common and joint tenancy. An estate conveyed to two or more people is presumed a tenancy in common, unless a joint tenancy is clearly specified (Conn. Gen. Stat. 47-14(a)). The primary characteristic of joint tenancy is the right of survivorship. In Connecticut, when joint tenancy is declared, the right of survivorship is presumed ( 47-14(a)). As with any conveyance of realty, a gift deed requires a complete legal description of the parcel. Recite the source of title to maintain a clear chain of title, and detail any restrictions associated with the property. Each grantor must sign the deed in the presence of a notary public for a valid transfer. Transfers in Connecticut require two witness signatures, one of which may be the notary official ( 47-5(a)(4)). All signatures must be original. All conveyances of real property require a Real Estate Conveyance Tax Return (OP-236) in Connecticut, completed by the grantor. For property located in more than one municipality, Conn. Gen. Stat. 12-500 requires a completed Real Estate Conveyance Tax Allocation Worksheet. Record the completed deed, along with any additional materials, in the appropriate town clerk's office. Contact the same office to verify accepted forms of payment. With gifts of real property, the recipient of the gift (grantee or donee) is not required to declare the amount of the gift as income, but if the property accrues income after the transaction, the grantee is responsible for paying the requisite state and federal income tax . Gifts of real property in Connecticut are subject to the federal gift tax. The person or entity making the gift (grantor or donor) is responsible for paying the federal gift tax; however, if the donor does not pay the gift tax, the donee (grantee) will be held liable . In accordance with federal law, individuals are permitted an annual exclusion of $14,000 on gifts. This means that if a gift is valued below $14,000, a federal gift tax return (Form 709) does not need to be filed. However, if the gift is something that could possibly be disputed by the IRS -- such as real property -- a donor may benefit from filing a Form 709 . 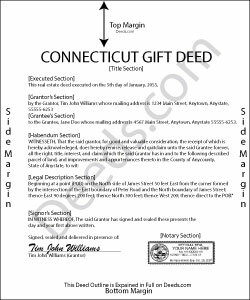 If a federal gift tax return is required, a state gift tax return (Form CT-709) is also required for Connecticut residents, as well as non-residents when the subject property is situated in Connecticut . For questions regarding state taxation laws, consult a tax specialist. This article is provided for informational purposes only and is not a substitute for the advice of an attorney. Contact a Connecticut lawyer with any questions about gift deeds or other issues related to the transfer of real property. Reply from Staff: Thank you David, glad to hear that. dorothy f. said: Thank you, for help. Reply from Staff: Anytime Dorothy, have a great day. Jenifer L. said: I'm an attorney. I see youve mixed up the terms "grantor" and "grantee" and their respective rights in this version. Anyone using it like this might have title troubles down the line. Reply from Staff: Thank you for your feedback Jenifer, we have flagged the document for review. Karri P. said: Great service and easy to purchase exactly what you want.